When Additional Score Options is selected in the Advanced preferences pane, you can create and edit chord grids in the Chord Grid Editor. You have many options when creating new chord grids from scratch, or when modifying existing chord grids. 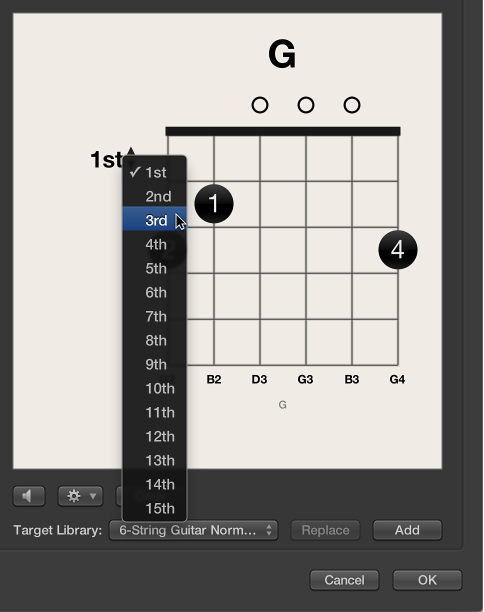 Click the Clear button in the Chord Grid Editor pane. The chord grid display is cleared, allowing you to create a new one from scratch. Note: Clicking the Clear button changes it to the Reset button. Set the Chord and View parameters to suit your needs. The Chord Grid Selector pane opens, with the new chord grid added to your chosen library. Double-click a chord grid in the Chord Grid Selector pane. The chord grid opens in the Chord Grid Editor pane. Click the Add or Replace button. The Chord Grid Selector pane opens, with the edited chord grid added or replaced in your chosen library. Click 1st to open a pop-up menu, then choose another fret number.